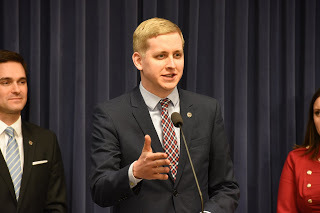 Springfield, IL – Members of the House Republican Caucus today called on House Democrats to respect the wishes of Illinoisans by allowing redistricting reform, HJRCA17, to be called for a vote immediately. HJRCA 17 would allow voters to decide, by statewide referendum, to amend the Illinois Constitution to create the Independent Redistricting Commission for the purpose of drawing legislative districts. A poll conducted by the Paul Simon Public Policy Institute last fall found that 72% of voters, including a majority of both Republicans and Democrats, supported the creation of an independent commission to draw legislative district maps. Members noted that redistricting reform is directly tied to the state budget and the failure of having unbalanced budgets for more than 10 years.